Some homeowners fall into the trap of thinking the exteriors of their homes don’t really matter because they don’t see them for more than a few minutes per day. These individuals tend to focus their efforts on creating the perfect interiors for their families. This is, of course, extremely important, but having an exterior you also love can boost your mood when you leave the house and when you come home. One great way to up your home’s “WOW” factor without breaking the bank is to consider vibrant, attractive front door and siding color combinations. Five awesome ideas are outlined in this guide, so by the time you’re done reading, your creative juices should be flowing. Remember, these are just meant to serve as inspiration. If you really love one of these ideas, go with it, but you can also come up with a completely unique combination that suits your personal tastes. Bright yellow-green – A bold, gutsy yellow-green door is perfect for any homeowner who isn’t afraid to make a statement. This will draw the eyes of passersby and will make your home stand out from any other on your block. Glidden’s Lime Sorbet is an excellent yellow-green shade that pairs especially well with khaki-colored siding and the same brand’s Bronzed Ivy for your trim. Turquoise – Turquoise is a striking color without being overpowering. It’s very welcoming and cheerful, which makes it the ideal choice for an entry door. 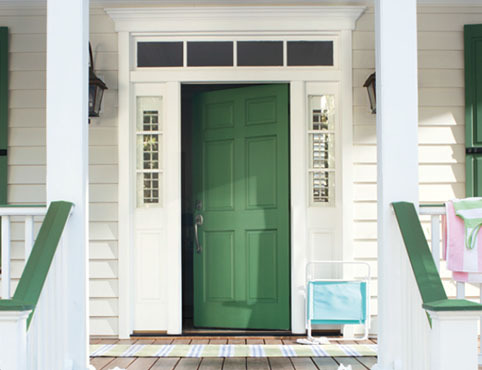 Martha Stewart Living’s Lagoon blue is a great choice for anyone who wants to try this door color. It looks particularly good next to mossy green or gray siding with Martha Stewart Living’s Lamb on the trim for contrast. Turquoise, it’s worth noting, is a great choice for coastal homes, like those in Charleston, SC. Orange – An orange front door isn’t for the faint of heart, but it can be a great look, especially on contemporary houses. Homes that have gray siding, unexpected trim, painted with something like Benjamin Moore’s Narragansett Green, look incredible paired with orange. If you’re looking for the ideal citrus hue, try Benjamin Moore’s Tangy Orange. Leaf green – More muted than the aforementioned yellow-green shade, leaf green evokes feelings of the rainforest and being one with nature. This color, like Mythic Paint’s Sweet Summer, looks amazing against mixed grey tones, like medium grey siding and Mythic Paint’s Grecian Gray for trim. Red – One of the primary perks of red entry doors is that they look good on any style of home. Whether you live in a cabin in Asheville, a suburban new build in Winston-Salem, or a historic abode in Charleston, you can go for a great red, such as Sherwin-Williams’ Red Tomato. This color looks especially good next to grey siding an extremely dark trim, like Sherwin-Williams’ Iron Ore. The team at Hatch Homes would love to handle your outdoor redesign for you. We know the idea of tackling a project like this can be daunting, particularly if you have a busy lifestyle and a lot of daily commitments. Allow our expert team to take the stress out of the process. Call us today to schedule your consultation.